Q. How can I link in-text citations to the reference list within Word? 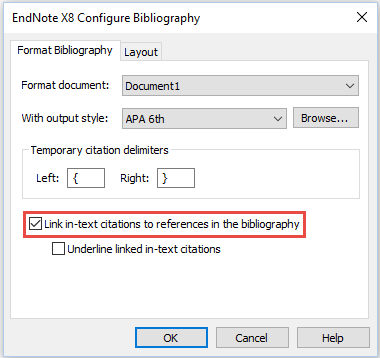 From the EndNote X8 tab, in the 'Bibliography' group, click the bottom corner arrow to display a Configure Bibliography dialog. Select a referencing style from the 'With output style' drop down menu. Tick the Link in-text citations to references in the bibliography box then click the 'OK' button.